Brandi has worked in the Salon and Spa industry since 1997. She has a background in massage therapy and has been a practicing esthetician for 10 years. 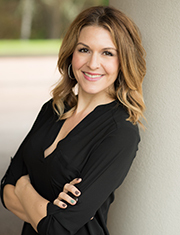 She brings with her a passion for result-oriented skincare and strives to give her client the results they are seeking. Brandi also loves waxing and is passionate about brow shaping and giving her clients the perfect shape they desire. Education and knowledge are highly important to her as she continues to evolve her skill through advanced education in skincare and brow services. Her recent accomplishments include the Master Esthetics program and courses in microblading techniques. When Brandi is not at Mollie Michelle she enjoys spending time with family, reading, yoga and cycling. She also loves being outdoors, going on long walks, hiking and camping.